objective measures of business regulations and their enforcement across 190 economies and selected cities at the subnational and regional level. In the Wall Street Journal, Josh Zumbrun and Ian Talley report that the ranking must be revised. Over time, World Bank staff put a heavy thumb on the scales of its report by repeatedly changing the methodology that was used to calculate the country rankings, Mr. Romer said. The focus of the World Bank’s corrections will be changes that had the effect of sharply penalizing the ranking of Chile under the most recent term of Chile’s outgoing president, Michelle Bachelet. Paul Romer, the World Bank’s chief economist, apologized. Update (Jan 16): On his blog, Paul Romer tries to clarify. This entry was posted in Notes and tagged Chile, Competitiveness, Doing Business, Political bias, Politics, Red tape, World Bank on January 13, 2018 by Dirk Niepelt. the fact that an international rule is negotiated and accepted by a democratically elected government does not inherently make that rule democratically legitimate. Rodrik distinguishes two types of international commitments. On the one hand, there are commitments that help to overcome time-inconsistency problems. [For example, the government] would like to commit to free trade or to fiscal balance, but realizes that over time it will give in to pressure and deviate from what is its optimal policy ex ante. So it chooses to tie its hands through external discipline. This way, when protectionists and big spenders show up at its door, the government says: “sorry, the WTO or the IMF will not let me do it.” Everyone is better off, save for the lobbyists and special interests. This is the good kind of delegation and external discipline. On the other hand, there are commitments that mainly serve to tie the hands of current or future political opponents. From an ex-ante welfare standpoint, this strategy has much less to recommend itself. The future government may have better or worse ideas about government policy, and it is not clear that restricting its policy space is a win-win outcome. This kind of external discipline has much less democratic legitimacy because, once again, it privileges one set of interests against others. In an earlier contribution, I have argued that a key role of the European Union should be to play the former role. This entry was posted in Notes and tagged Commitment, Conflict of interest, International treaty, Politics, Time inconsistency on October 25, 2016 by Dirk Niepelt. 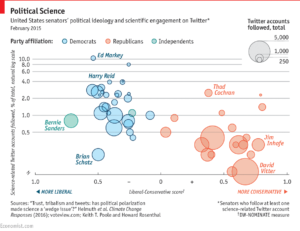 While the Senate’s interest in science is generally quite low, Senate Democrats are three times more likely than Republicans to follow science-related Twitter accounts like NASA or the National Oceanic and Atmospheric Administration. Interest in science, the authors conclude, “may now primarily be a ‘Democrat’ value”. This entry was posted in Notes and tagged Democrat, Politics, Republican, Science, Senate, United States on June 13, 2016 by Dirk Niepelt. Slides for presentation at Lilienberg Unternehmerforum conference on “Geldpolitik 2020—Grundlagen und Szenarien (Scenarios for Monetary Policy 2020),” October 4, 2013. PDF. Stability anchor vs. special forces unit. This entry was posted in Contributions and tagged Central bank, Credibility, Expectations, Independence, Politics on October 4, 2013 by Dirk Niepelt.